The Herbalife journey with IMPACT has taken course over many years and the constant upgrading and improvements we have seen is commendable. From infrastructure to facilities, IMPACT has expanded at an exponential rate. The hotel and leisure options are plentiful, with exciting F&B outlets within close proximity. It is really a world class venue worthy of international events. Prasit and team have been our core support and never once resting on their laurels, providing exceptional services better on each year. The flexibility of the team with the roll up sleeve attitude had contributed to the many success stories of the event. The attention to details and strict governance on safety processes, allows the client to feel at ease, that the IMPACT team has our backs and will be there to ensure every area is covered. Once again I’d like to extend my sincere gratitude for those who has put in their heart and soul to making Herbalife events such a success, Som, First, Jan, Ang, Prasit. Let’s continue to build it bigger and better. We organized the APAC 2017 Coaching Conference at IMPACT in May 2017 and it was a huge success. It was the very first time that over 700 professional coaches from 35 countries around the world gathered together to exchange ideas and the art of coaching. It was another great event that brought reputation to Thailand. The venue partly contributed to the success of our event. The event was a large-scale seminar and our venue at IMPACT was well-equipped with all of the facilities we would need. The food was delicious and impressed our international guests. We were also impressed with the great service provided including venue recommendations, financial management and budgeting, as well as immediate problem solving. We received positive feedback from the working committees of the Asia Pacific Alliance of Coaches (APAC) and the guests. I’d like to express my sincere gratitude and appreciation to IMPACT Forum management team for their great support. with their professional service among all stakeholders. I was impressed with all the IMPACT staff members. Thanks to the sales team, including Khun Sai and Khun Ann, for their assistance in giving us the information and advice, responding to our inquiries, coordinating with the concerned parties to ensure that everything went well and met the expectations of the groom and I. On our wedding day, Khun Joy and her team worked in a very professional manner. They really helped us with the event setting and the order of the formal ceremony. Since we didn’t hire a wedding organizer, we had no idea about the order of events. Fortunately, IMPACT staff knew what they were doing, and our wedding ran perfectly and smoothly. At the reception, every staff member was happy to provide their help and service. Another impression we had was when a male staff (I am sorry I didn’t ask for his name) not only brought us something to drink throughout the whole event, but also informed us that our dinner set was ready for us; he reminded us several times as we were walking all over the place at the end of the ceremony. In addition, he helped fetch a cart to carry our stuff after the event was over. I would like to express my appreciation and gratitude to IMPACT for paying attention to every detail. Our guests were also impressed with the arrangement and service. They all gave compliments to IMPACT for the well-organized event, delicious food, beautiful setting, and the security guard who helped direct parking in the parking building even though there was heavy traffic on that day due to many other exhibitions. Once again, I would really like to thank the IMPACT staff for all their good and hard work. ​A venue which showcases true Thai hospitality and warmth, IMPACT is the go-to venue for Show Organizers and alike. Just with the completion of THAIFEX-World of Food Asia, more than 85% of our visitors had positive reviews about IMPACT and its facilities and restaurants, albeit the hot weather and crazy traffic. With its constant upgrades and improvement programs, IMPACT will certainly be the top venue in ASEAN in time to come. We will always look forward to organizing an event in IMPACT, where partners become friends. The management team at IMPACT is very professional when it comes to problem solving to ensure a successful event. 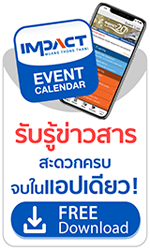 THE MALL has organized 23 events at IMPACT Muang Thong Than over the past 5 years. IMPACT staff are very attentive, cooperative and helpful. They have always been able to solve our problems. We really appreciate their great coordination of various aspects of the event, including traffic, drainage and security, thanks to IMPACT management team for taking these matters seriously and making our event a great success every year. We have organized Money Expo at Challenger Hall and were impressed with the professionalism of IMPACT staff, the standard of service delivered, and the quality of facilities provided, helping us gain the trust of the participating exhibitors and ensuring that everything ran smoothly. We have been successfully working with IMPACT for the past 8 years. They understand the event and exhibitor requirements and keep improving their service. Their attention to small details also impressed us and ensured us that everyone working towards the same goal. I believe that together, we can continue to achieve better outcomes. The Thai Poultry Veterinary Association has organized several events at IMPACT and we have noticed their continued improvements. The food choices are varied, and the meeting rooms are beautiful and well equipped with state-of-the-art facilities. Moreover, the staff are always helpful and supportive. IMPACT is an excellent venue for any event and we look forward to holding our future events here.